6 simple ingredients are all you need to make this no-bake, Healthy Apple Cinnamon Granola Bars recipe. These homemade granola bars are chewy, super easy to make and taste just like apple pie! A gluten-free, kid-friendly recipe that can easily be made vegan. If you have ever made homemade granola bars, you know that they are so much better than store-bought snack bars. They are less processed, less sugary and they just taste better. 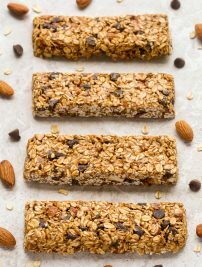 This homemade granola bar recipe is made entirely with nutritious ingredients, such as rolled oats, walnuts, dried apple and cinnamon. Pureed dates and honey act like a glue that binds everything together, while infusing the bars with natural sweetness. Firmly press the granola mixture into the baking pan with your hands, the sides of a mug or a flat dish. Allow the granola mixture to chill and harden completely in the freezer before cutting into bars. The three steps above will really help the granola bars to hold together when sliced. These granola bars make an ideal on-the-go snack, because they are perfectly portable and will keep you feeling full for hours. Once you try these wholesome, flavorful granola bars, you will forget about buying the boxed ones for good! These easy, homemade Healthy Apple Cinnamon Granola Bars are no bake, chewy and perfect for kids! A gluten free recipe that can easily be made vegan. In a large mixing bowl, combine the oats and cinnamon. Stir in the dried apple and walnuts. To ensure this recipe is gluten-free, use certified gluten-free rolled oats. 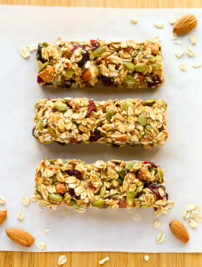 Your granola snack bars sound so easy to prepare! I love non bake desserts and sweets because that means there is a low chance I will mess up the recipe, haha. Thank you Sarah! 🙂 Haha aww, yes this granola bar recipe is pretty much foolproof, so you should be just fine!